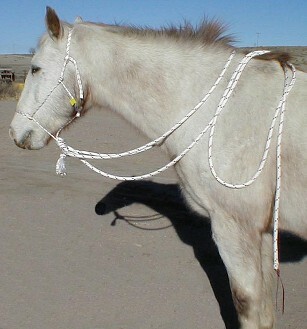 to offer you quality affordable rope tack. 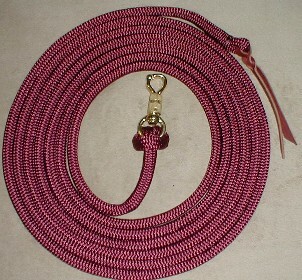 Cooler Horsemanship rope tack is made and shipped by Handcrafted Jewels Rope Horse Tack. 1/4" Halters, Strings, etc... offered in these colors. 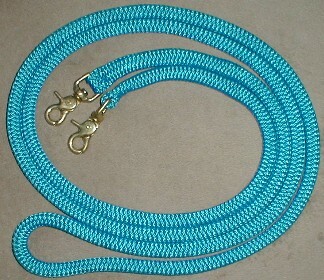 1/2" Leads, Lines, Reins, etc... offered in these colors. 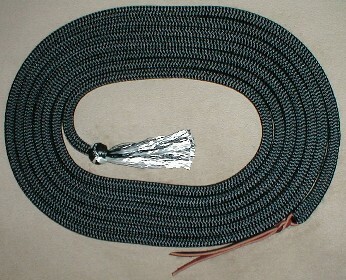 Halters are made from a 1/4" soft double braid rope. They feature a fiador knot, and knot keeper above the fiador knot. 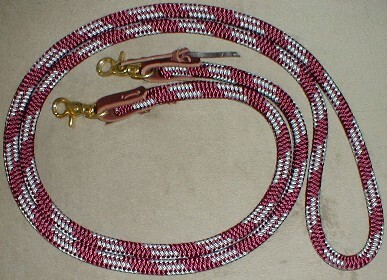 1/2" Leads made from double braided rope, feature a spliced loop end and spliced popper end with latigo leather popper. Offered with or without a brass twist snap. 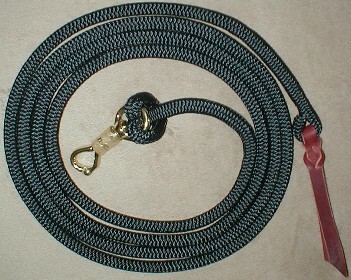 1/2" x 22' Line made from double braided rope, feature a spliced loop end and spliced popper end with latigo leather popper. Offered with loop, ring and clip, or a brass twist snap. 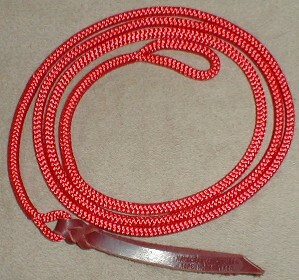 6' x 1/4" Training String made from double braided rope with loop ends and latigo popper. Light weight stick is made from fiberglass and features a leather tip and rubber handle. All sticks are shipped Priority Mail insured, if your stick is damaged in shipping, please email me right away with details of damage, so I can file a claim. All sticks are shipped separately from other items purchased due to the post office destroying boxes. This way only the stick does not get delivered. 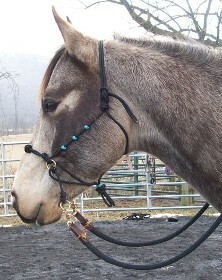 1/2" Double braided rope Loop Reins, features leather water loops and trigger snaps. 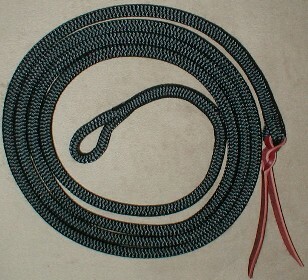 1/2" Double braided rope Loop Reins, features direct attached trigger snaps. 1/2" Double braided rope Mecate. Made with a tassel and spliced popper end with a latigo leather popper. Features a tassel and latigo leather popper. 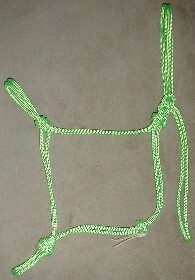 AB Side Pull - made with 1/4" soft rope. 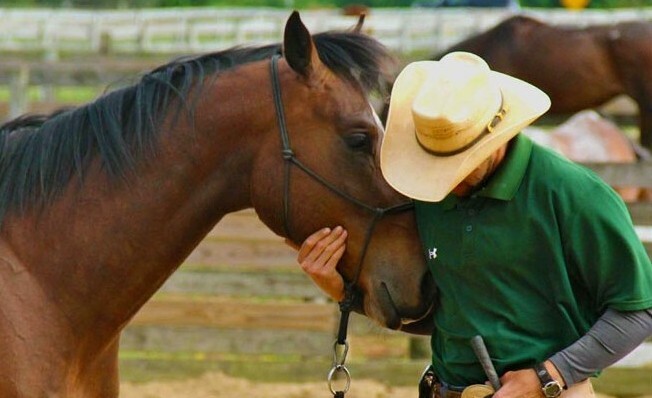 Options - extra nose knots or plain noseband. The ones pictured have braiding - Prices are without braiding. Most orders ship within 3-4 working days, shipped USPS First Class if under 1 lb. or USPS Priority Mail if over 1 lb.